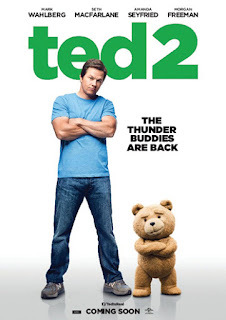 Ted 2 is a new comedy movie written and directed by Seth MacFarlane (Family Guy, A Million Ways to Die in the West). This is a sequel to the 2012 film Ted and once again stars MacFarlane as the voice of the title role alongside “Marky Mark” Wahlberg (The Departed, The Fighter). Some other members of the supporting cast include: Amanda Seyfried, Jessica Barth, Givoanni Ribisi, Morgan Freeman, Liam Neeson and yes, Tom Brady. As a big fan of Seth MacFarlane’s animated work and two previous live action films, I was really looking forward to this movie. However, I think that most comedy sequels are extremely disappointing, so I couldn’t help being just a little bit skeptical heading into the theater. The film opens up with the wedding of Ted (MacFarlane) and Tami-Lynn (Jessica Barth). Meanwhile, John Bennet (Mark Wahlberg) is six months divorced from his wife from the previous movie. One year after Ted’s wedding, he and Tami-Lynn continue to fight constantly, eventually deciding to have a child to try to fix their marriage. However, in order to qualify as a legal guardian, Ted must prove that he is a human being (not property) in a court of law. John and Ted decide to team up with a young lawyer named Samantha (Amanda Seyfried) in order to bring Ted justice. As I mentioned earlier, I am a big fan of Seth MacFarlane’s work, so his distinct style of humor that some people may find offensive doesn’t really bother me. Having said that, if you can say the same for yourself and enjoyed the first Ted movie, I can all but guarantee that you will enjoy this film as well. The plot for this sequel is just as ridiculous and predictable as the original, but personally I find that funny in it’s own right. Mark Wahlberg and Seth MacFarlane once again have great chemistry as the two main characters and Amanda Seyfried actually fit in nicely to form a new trio. For the most part, although many were offensive, all of the jokes worked and only a few fell flat for me. In the end, I think that Seth MacFarlane delivered once again with Ted 2, and even though it didn’t quite live up to the original, I can honestly say that this movie is that rare comedy sequel that basically had me laughing out loud from start to finish.